Isn’t history underwhelming these days? Billed as a “seismic shift” and with journalists gorging on SDP-cliche, the Independence Group launched yesterday in a blaze of incoherence with a wonderful hot mic moment and some ad hoc racism. Given that one of their key accusations against Corbyn’s Labour Party is racism (in the form of anti-semitism) – and a critique of Labour presentation – this was a very bad start. 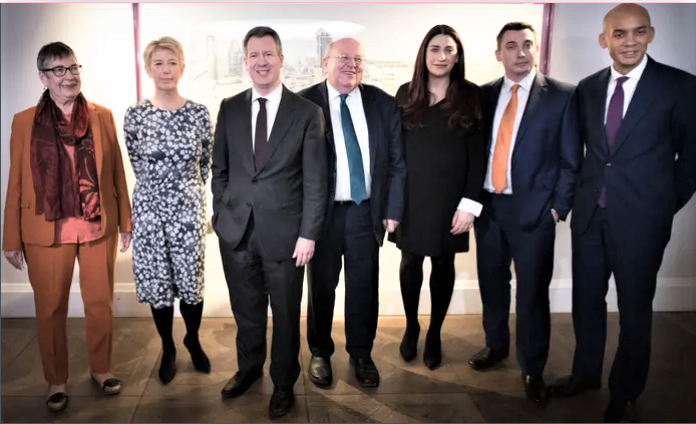 Described by one as having: “No policies, no ideas, no substance: Chuka Umunna’s Independent Group is a tantrum thrown by careerists who found their avenues of progression closed off”, it was an event high on comedy and low on gravitas. The rebels (loosely defined) had been dithering for weeks, or even months (actually about three years) and now appeared as an unconvincing cabal of re-tread politicians looking for an excuse to leave. This was – essentially – Chuka Umunna trying to regurgitate the discredited New Labour brand with some hidden lolly and a lot of media attention. This might be a popular if premature assessment, but it does have some merit. While it’s easy to laugh at the unconvincing characters, the botched launch, the talk of a “new politics” and the media mismanagement, it’s actually far worse than that. This group are launching a new “centrist” party just after almost everyone in the universe has realised that centrism is dead. Only a political splinter nurtured in the petri-dish of liberal media political illiteracy could do such a thing. The Blairite consensus that “elections are won from the centre ground” is long past. Last summer this analysis was everywhere. “A year after plotters tried to oust Jeremy Corbyn for being unelectably leftwing, those on the right of Labour have finally fallen silent. The Liberal Democrats made no electoral breakthrough, despite being the only go-to party for Brexit dissenters. And the left of the Tory party looks embittered and lost. I, for one, am delighted that centrism is ailing, because there has long been a fantasy at the heart of it that rots our brains and makes us servile – a very British kind of fantasy that there exists such a thing as non-ideological politics, some calm and sensible mid-point set between the howling gales of ideological extremes. Centrists think this is where the grown-ups do their politics. Indeed, the very metaphor of the “centre” uses language to position others out on to the suspicious “extremes”. This idea of a mythical centre ground that transcends all and emerges in the “national interest” is actually very prevalent in Scottish indy circles, frequently trotted out by people who don’t want political debate or can’t manage political analysis. In this analysis – the Labour Party are just to remain in aspic forever located on a static political point – around which Alex and others can locate them. To alter from this position is upsetting and alarming. He writes: “Labour has been seized by a far-left faction” (by “seized” I think he means “elected”). You get the gist, things have changed and this isn’t good. It’s as if all of the collapsing politics of the past five years never happened at all: the financial crash, a charade; the populist surges of Brexit and Trump, ignored; the rise of English nationalism, unseen. What have you to learn from the failure of Hillary Clinton’s campaign? Absolutely nothing. Nor do the group’s own politics bear up to examination. “In January 2014, when Cameron was calling for curbs on EU migrants access for benefits. Umunna went further on BBC Question time and called the EU to ban Freedom of Movement for “low skilled” migrants. In 2015, Umunna made a speech at Labour Conference fringe meeting stating as a mixed-race MP it was his duty to condemn immigrants in his constituency for failing to learn English as his dad (an anglophone Nigerian businessman) was able to. Yes politics is broken. One of the reasons politics is broken is the combination of slick spin and illegal war brought by the New Labour government. The idea that that model can be revived long after it’s deceased by Mike Japes in the midst of the Brexit clusterbourach is being given a lot more credence than it deserves. The UK during the Second War was run by a government of national unity and looks to have been successful. I contend that that government would be classed as centralist. During that period Beveridge came out with his blue print for the post war state. I contend that Beveridge got it right. By far the most successful country in Europe is Germany and it is currently governed by a government of national unity. In contrast I see the UK Tory Government in Westminster as a total shambles aided and abetted by an out of time Labour dogmatist. Scotland post-independence will need a government of national unity if it is to survive the loss of financial support from the Westminster Government. Scotland does not receive financial support from Westminster. Westminster however receives substantial financial support from Scotland to help pay for London Cross rail, HS2, Hinckley point, the Iraq war, Trident, the BBC and as Scotland runs and has run a trade surplus for many years Scotland also helps out with the Westminster government debt currently standing at £2 trillion and growing without any plans to reduce it instead pursuing the final sell off of UK assets post Brexit. I watched the whole Politics Live programme yesterday. Ash Sakar described herself as South Asian and said she had a ‘white step dad.’ Then she corrected herself and said jokingly ‘actually he is kinda pink ‘. Shortly after the ex – Labour MP women in her answer looked to Ash I felt she was trying ( badly) to refer to the joke Ash had made earlier by using the word ‘tinge’. Today the Politics Live went over the incident but only showed the ex- Labour MP getting her words wrong. Did anyone else see the whole interaction ? I understand why when listened to in isolation her words are really offensive sounding but I think it comes across slightly differently in the contest of the whole conversation. Pathetic to do this now. Shows just how narcissistic Westminster has become..
Mike – what does this split mean in your view for Scottish politics? There seems to be no hint of Scottish Labour or Conservative parties splitting? Would that mean, paradoxically, a further divergence of Scottish from English politics? Would a party formed by the Independent group have any resonance in Scotland? Have they anything distinctive to say about Scotland? I don’t think ts really means that much for Scotland and no they have nothing to say about devolution, independence, the constitution or anything else. But is there a possibility of a more mainstream Tory party suviving in Scotland invigorated by the debate over Scottish independence, while in England the Tory party becomes increasingly extreme? How does a party led by Ruth Davidson and Jackson Carlaw react to a UK party (if Anna Soubry is to be believed) dominated by Steve Baker and Rees-Mogg? Whatever you think of the Scottish Tory leadership, I don’t think they share much ideologically with the ERG. Your Ruth Davidson /Rees Mogg comparison reminds me of the man who was depressed because he had no shoes, until he met a man who had no feet.